The Cambridge Fire Department reports (with photos) that firefighters rescued the freezing pup from the frigid waters of the Charles near the Eliot Bridge around 3:50 p.m. today. 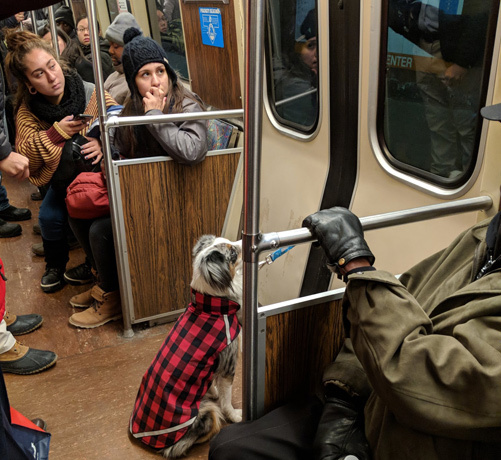 Krista reports on the scene on the Orange Line at Tufts Medical Center this afternoon when a man and his dog started to get off the train, only the door closed between them, leaving them attached by a leash, but unable to get to each other: Read more. NorthEndWaterfront.com reports on yesterday's opening of a new dog park in the North End. The Supreme Judicial Court today dismissed a teenager's conviction for causing "serious bodily harm" to a friend's dog, ruling that the phrase "serious bodily harm" in state juvenile laws is only intended for cases involving people. Read more. Kevin Kane reports that Wednesday evening, his dog, Gerry, ran out of his yard when a delivery-package guy didn't close the gate and wound up on Morrissey Boulevard, where he was hit by a car. Read more. A concerned citizen alerts the city that somebody's posting signs along River Street near Metropolitan Avenue in Hyde Park, urging people who are too damn lazy to scoop their dog's more solid waste into a plastic bag to use conveniently placed storm sewers instead, rather than letting them befoul the sidewalks. Jamaica Plain News posts photos from yesterday's dog parade in Jamaica Plain. Transit Police report arresting two New Yorkers at the Salem commuter-rail parking garage yesterday evening after finding their French bulldog dead of apparent overheating after being left alone in a car for five hours. Read more. SafeResponsibleMover shows us a sign taped to a tree on Marlborough Street in the Back Bay. Yesterday, somebody filed a complaint (complete with photo) about somebody who keeps dropping his or her pet's rear-end extrusions next to one particular tree on Dartmouth Street in the South End.